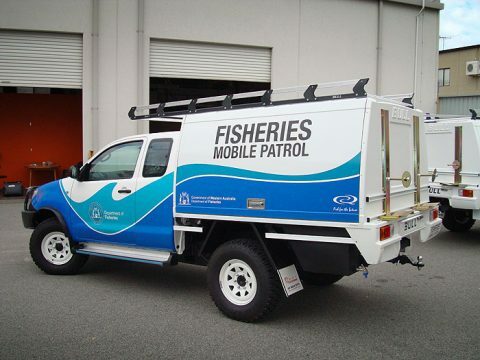 A vehicle wrap is one of the most eye catching methods of vehicle signage around. Using high performance cast vinyl which can conform to curves around the car, we can completely or partially cover a vehicle, truck or bus. 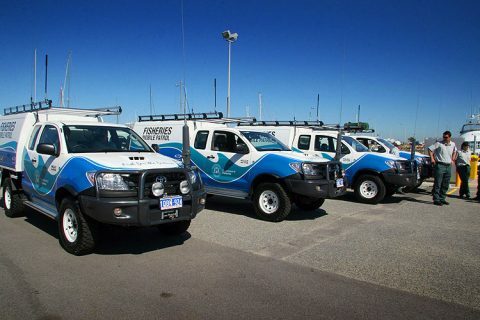 In this case, a fleet of Toyota Hiluxes has been signwritten with Mobile Fisheries Patrol livery. Perth Graphics Centre, the most progressive sign shop in Western Australia, has just completed the livery project, using 3M 380 CV3 and 8580 overlaminate. The result, as you can see, is a striking vehicle wrap which covers several vehicles which can now be easily identified. If you’d like signage, or a vehicle wrap done on your Toyota Hilux, then give us a call for a quote.